Can We Use Our Own Shipping Container To Move Interstate? Yes. It is not uncommon for us to transport customer owned moving containers. For destinations such as Hobart and anywhere that is a long way from the nearest rail terminal, it can often be a cost effective option. The reason for this is because of needing two truck trips at each end of your self pack move (One to drop off and one to pick up the moving container), you will only need one truck trip at each end. If you have decided to purchase your own container you may be wondering where to obtain one. We do not supply containers for sale directly although we can point you in the direction of suppliers that we have a working relationship with. Whether you purchase a 20 foot moving container or a 40 foot moving container - it will need to be transportable by rail and up to date with a CSC inspection certificate. Please note: we do not transport 10 foot containers. Please note that we can only transport containers that are up to date with their CSC inspections. 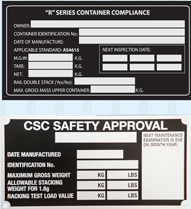 If you are buying a container, it should come with either a certificate stating that it is safe to be transported by rail or there will be a sticker on the container identification plate. Give us a call if you are not sure about this. If you have a container you can find a list of qualified container inspectors here.